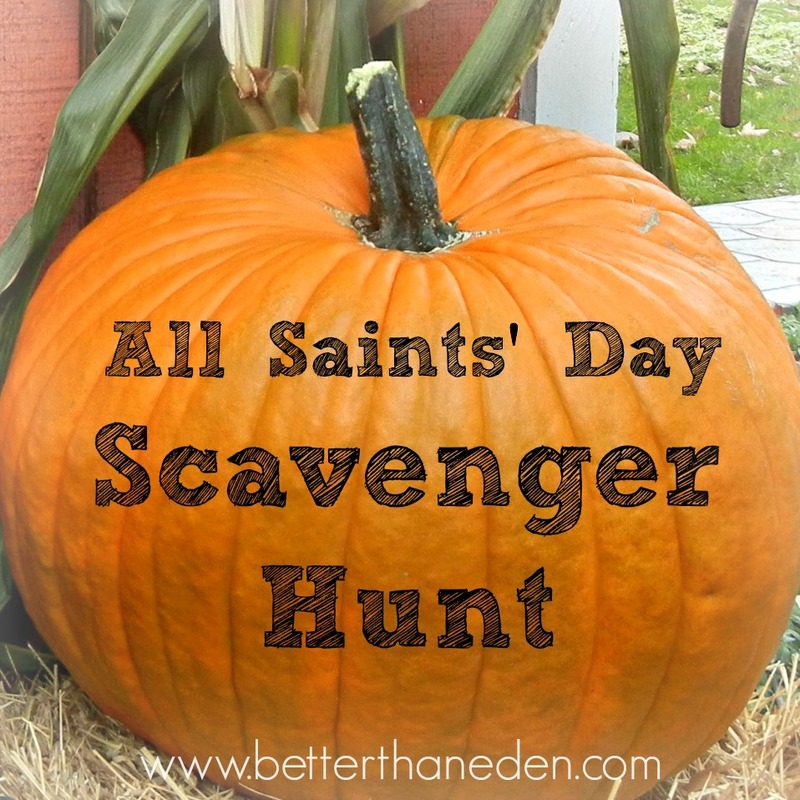 Looking for a great activity for a group of children to celebrate All Saints' Day? A few years ago I created a little scavenger hunt that we've done at our annual party and I'd like to share it with you! It takes a little bit of preparation the first year but once you have your items you can store them for the next year. 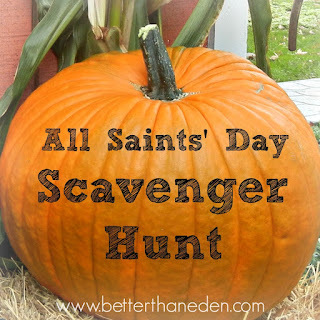 This scavenger hunt involves searching for the saints' lost items which we hide before the party all around the church gym and hallway. Before the party we hide the items in groups (meaning that say, all of the St. George swords are in one spot) and when a child finds it they put only one of the item in their paper bag. Once they've found all the items they are finished! They can then search for a prize in our St. Anthony Lost and Found Box. This hunt is great for the older kids, especially ages 6-10. The littler ones enjoy it as well but usually need to be paired with an adult or older sibling. You can download or print the scavenger hunt sheet for free below! To download or print, click on the 'pop out button in the upper right corner of the window. Below I've listed what we've used for those items. It's fun to watch the kids try to figure out what each item is supposed to be and discuss amongst themselves. Feel free to be creative and use what you have! There are so many more items and saints to substitute if one or more of these can't be found. Oh, and please don't hesitate to let me know if you have a question! St. David's harp - The dollar store had a bag of tiny harps with their Christmas ornaments! St. Gabriel's horn - Just like the harps, they had a package of horns with the Christmas items. St. James' seashell - Once again, dollar store! Look near the vases for small packages of shells. At the end of the shindig remember to collect the bags and sort the items out again. Then simply save them in baggies and your next year self will thank you big time. I'm hoping to post a few of our other favorite All Saints' games in the next few days. Stay tuned! Wow this is legit involved. I wonder how much of this I could hobble together in a day? What a great idea. In a crunch you could maybe print out small clipart pictures for all the items like I do for some of them! Good luck! Another option would be to see if you could find stamps of each one and stamp the paper with each stamp as they are found, perhaps?